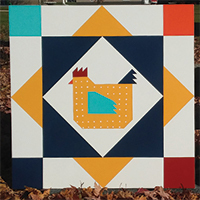 Add some color to your coop with a limited edition Coop Quilt. Double wall vacuum insulated black stainless steel is alot of adjectives for one cup. White Murray McMurray Hatchery window decal over a clear backing. Approximately 4" by 4". Ultra soft, and ultra awesome McMurray Hatchery Cabin Thow. We liked this blanket so much we put our name on it. A unique gift for any cook. These delightful tins will make a great gift for the poultry lover or the chicken motif decorator! Add a fun touch to your kitchen, living room or chicken coop. The print has an image size of 11 inches X 14 inches and a print size of 16 X 20 inches. This will be a limited edition of 500 prints, with each print numbered and signed by the artist.